Our kits are packaged to give you the best value and performance! Complete detailing kits from Bio-Tech Industries put everything you need for a professional finish in one convenient case. Our complete detailing kits combine some of the finest waxes with plenty of extras for full-on care. 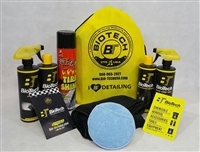 The products in each kit work together to clean and preserve your vehicle's paint. Many kits include brushes and applicators to help the products perform their best. Take advantage of these special kit savings on our finest interior car care products. 6 Piece Mini Buffing Pad Kit 3"